The Shahed 129 (Persian: شاهد ۱۲۹‎‎, English: "Eye-Witness") is an Iranian Unmanned Combat Aerial Vehicle (UCAV) first publicly unveiled in September 2012. The aircraft is claimed to be capable of carrying out combat and reconnaissance missions with an endurance of 24 hours, making it the first Iranian MALE UAV . Work on the project has been underway in 2007 as this was the time when Iran announced the production of cloned Wankel engines for UAV. 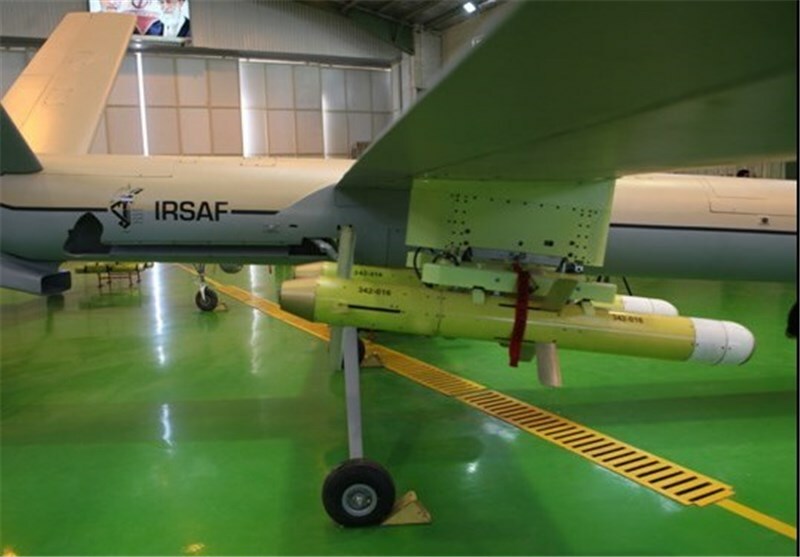 Production of different parts of the UAV was assigned to different subsidiaries of IRGC like Malek Ashtar University and Shahed Research Center. The final assembly is done in HESA. In July 2012, Shahed 129 was first seen in Great Prophet 7 war games along with some other new UAV. But it was September 2012 that Iran officially unveiled the UAV. As land based communications limit the range that the aircraft can go without losing the link to the control station, Shahed 129 uses an autopilot system similar to Karrar to follow some predefined way-points and conduct its mission, beyond control station's communication range. Iranian military officials have said that Shahed 129 UAV can increase Iran's surveillance capabilities in border areas, the Persian Gulf and the Sea of Oman. Shahed 129 is said to be able to carry Sadid-1 missiles, making it Iran's second weapons capable UAV after Karrar. This suggests that Sadid-1 is not solely a light anti-ship missile but supports more general purpose air to surface strike roles. Based on the footage, a rough estimate of the size of the drone would be: Wing span: 16 m and Length: ~8 m.
General Aziz Jafari the chief of the IRGC announced that Iran is currently marketing the Shahed-129 UCAV for export to potential international customers. On April 10, 2014, rebels in Syria recorded a UAV resembling a Shahed 129 flying over Eastern Ghouta, Damascus. ↑ "Iran unveils 'Epic' new drone". Russia Today. 10 May 2013. Retrieved 6 November 2013. ↑ "Iranian experts make Liko radar-evading drone". Press TV. 23 September 2012. Retrieved 26 September 2012. ↑ "Iran's IRGC produces new 24-hour airborne drone: Cmdr.". Press TV. 17 September 2012. Retrieved 26 September 2012.